It’s been a long time coming, but it’s finally here. Well, actually, it was here in June last year. I’ve just been a little slow in getting around to writing about it. 🙂 Walking Shadows, the sequel to Narrelle M Harris’s 2007 vampire novel, The Opposite of Life, was released in June last year. It has certainly been worth the wait. The Opposite of Life was a vampire novel with a difference (see my review). It introduced readers to Lissa the librarian, who has a knack for finding herself in the wrong place at the wrong time, and Gary, the podgy, Hawaiian-shirt wearing, daggy vampire. After solving the mystery behind a killing spree in that novel, there was a promise of their return. And so we waited. They did return briefly in January 2012 with a short story, “Showtime”, published in a collection of the same name (see “Showtime”). But now finally, we have a new novel. This time around Lissa and Gary have to deal with vampire hunters. Walking Shadows has everything that made The Opposite of Life such a great read. The Melbourne setting is vivid and vibrant (particularly if you happen to know the city), but this time we also venture out to Sovereign Hill, which is a real treat. The main characters are as interesting and flawed and real as ever, even those who are not human anymore. As with the first novel, this one is never quite what you expect it to be — which is wonderful and makes for exciting reading. Even those few plot elements that seem predictable, end up going in unexpected directions. As is often the case with Harris’s writing, there is an emphasis on family — its importance; its inescapable nature; and often, the pain that comes with it. These elements are evident even in the characters who have no family — the absence of family being as important to a character’s makeup as the presence of a dysfunctional family. Vampires, of course, are the main focus of the story — the dangerous, blood-sucking, neck-biting variety rather than the sparkly, angst-ridden sort. But Harris has given us her own unique take on the mythical creatures. I particularly love the fact that they lose the ability to learn after they are turned and that blood is not a necessity to them — rather it is something akin to a drug that makes then feel almost human for a short time. It’s no secret that I am a fan of Harris’s writing (and, by the way, I would highly recommend you checking out her early crime novellas Fly By Night and Sacrifice, which are available as e-books). I think this is a great book. If you like vampires, chances are you will love this book. If you’re not really into vampires, give this book a try anyway as an example of a non-clichéd approach to the genre. I hope I don’t have to wait too long for the next instalment in the adventures of Lissa and Gary. Last post I showed you some of the videos available from the National Year of Reading (NYR12) website and YouTube channel (see: “NYR12 vids”). But there are lots more videos out there. NYR12 has not only promoted the joy of books and reading, it has also encouraged others to do so. And so many people across Australia have taken up that challenge — to spread the word and to promote reading. Timothy Chan, an official Friend of NYR12, took it upon himself to coordinate a unique project — Love2ReadTV. He banded together numerous NYR12 Friends, getting each of them to record a video about the importance of reading in their lives. He has then edited those videos together into a series of webisodes and posted them to the Love2ReadTV website. There are three episodes, so far. Episode One features Adam Wallace (author of Dawn of the Zombie Knights), Deby Adair, Mick Walsh, Morgan Schatz Blackrose and Meredith Costain (author of Bed Tails and the A Year In Girl Hell series). Episode Two features: Nicky Johnston (author/illustrator of Happy Thoughts are Everywhere), Dee White (author of Letters to Leonardo), George Ivanoff (that would be me) and Juliet M Sampson (author of Behind the Mask). Episode Three features: Peter Cawdron, Narrelle M Harris (author of Walking Shadows), Ron & Margaret Sharp and Alice Pung (author of Growing Up Asian in Australia). Go to YouTube and search for “National Year of Reading 2012”. You’ll find lots of other videos created by people and organisations to celebrate NYR12. Do you have a favourite NYR12 video? Share it in the comments section below. I’m sticking with the small press theme of my last post. From Felicity Dowker’s book, Bread and Circuses, we go to Narrelle M Harris’s Showtime. From Ticonderoga Publications we go to Twelfth Planet Press. And Asymmetry by Thoraiya Dyer is the next scheduled release. All the stories deal with the concept of family and they all have a supernatural element. But each story also has a unique approach, often twisting an expected element. I think that Harris is at her best when combining dark supernatural themes with humour. And you certainly get that in Showtime. It’s an excellent little collection and a great introduction to her writing. My only complaint is that four stories are not enough. Yesterday’s post had the inflammatory, and slightly misleading title of “The anti-eBook rant”. So to balance things out a bit, today I present to you, “In defence of eBooks”. Of course, as with yesterday’s title, it is a bit misleading. I’m not really going to defend eBooks — they don’t need defending… they’re doing quite nicely without my metaphorical sword and shield. Yesterday I outlined why I don’t currently read eBooks. Today I’m going to tell you under what circumstances I would use them in the foreseeable future. I have purchased Trudi Canavan’s Black Magician trilogy in lovely hardcover volumes. They come in a limited edition, collectable slipcase, which also contains a medallion of the Magicians’ Guild logo with an engraved code. I hop online, enter my code and download my digital copy of the trilogy. I load it up onto my mobile phone. I then proceed to read the lovely hardcovers. But then I get stuck on a train that has broken down between stations… and I finish the first book… and I don’t have the next one with me… oh wait… I whip out my phone and begin to read book two. But am I going to go out and specifically puchase an eBook copy of every dead-tree book I buy, on the off chance that I’ll need it in an emergency? I don’t think so. So, under what other circumstances could I be enticed over to the digital side? If I was to go back to study (and I do occasionally toy with the idea of a PhD), I think that I would use eBooks. The idea of heading off to Uni with just an iPad, rather than a bagful of books is rather appealing. As is the ability to search reference books. Yes, if I were a student I would definitely use eBooks. Sometimes, my wife and I talk about our retirement — about a not-too-distant future, after we’ve kicked the kids out and earned enough money to do some extensive travelling. We talk about selling our house, downsizing to a small apartment, and heading off to explore the world in six-month long expeditions. And if this were ever to come true, I think I’d much rather pack an eBook reader than a suitcase full of books that I’d have to carry from one country to the next. But, until the world travel or the return to study begins, or until dead-tree books come with a digital copy enclosed… I’ll stick with the good, old-fashioned dead-tree books. Vampires! Lots of them! And they are in Australia. In our past, our present and our future. Thirty-three blood-sucking stories in one huge book — Dead Red Heart. Lately, I’ve been hearing talk that the vampire has had his day in popular fiction, at least for the time being… That the sparkliness of some recent vampires has dulled the appeal of the blood-sucking genre. And yet they keep showing up. From the recent YA novel Department 19 (reviewed here) and its upcoming sequel, to a new picture book by Margaret Wild and Andrew Yeo, called Vampyre. Despite what some people may say, I don’t think there’s any danger of the fictional vampire fading into obscurity. I’m particularly enamoured with vampire stories set in Australia. Apart from a simple interest in my homeland, the concept of vampires in ‘a sunburnt country’ is rather fascinating. One of my favourite vampire novels is Narrelle M Harris’s Melbourne-based tale, The Opposite of Life. I’m told that a sequel is on the way, and I’m very much looking forward to it. Then there’s the Sydney-based Solace and Grief by Foz Meadows. The sequel, The Key to Starveldt, comes out in October. But while I’m waiting for these two sequels, I’m satisfying my bloodlust with Dead Red Heart. Edited by Russell B Farr and published by Australian small press publisher Ticonderoga Publications, it contains stories from writers both established and new. Even I feature in its pages with a little story called “Vitality”, about a vampire and a hill hoist. Dead Red Heart is large book, and I’ve got a stack of review books to get through, so I’ve been dipping into this anthology rather than working my way from cover to cover in one go. I’ve been picking out a couple of stories between each of the novels I’m reading. I’m not even half the way through but I am enjoying it immensely. Despite the common subject matter, there are such a variety of stories. My favourites so far are Felicity Dowker’s wonderful tale of vampires, tattoos and revenge, “Red Delicious”, and Jeremy Sadler’s take on the Ned Kelly story, “Such is Life”. It did not feel real until the book was in my hands. I had sent my story, “Such Is Life”, off into the wild with the expectation that I would never hear about it again. Though secretly, deep inside, metaphorical fingers were crossed. Everything I’ve written up to this point that appeared in the public domain has been self-published. From various fanzines to a partnership in producing Frontier: The Australian Science Fiction Media Magazine, to articles and reviews on the Internet, it has always been my hand that has delivered my words to the world. This makes it a momentous occasion for me when someone else deems something I have written as worthy of publication. I never anticipated my first “professional” published work would be Australian vampire fiction — but then it seems so appropriate. The book in my hands finally gave substance to the excitement, and there was a certain joy in re-reading what I had written, as if it was new. It sat among fabulous company from notable authors. How could I not be pleased? Now it’s a matter of using that excitement to feed more writing and having more items published, and to enjoy even more “now it feels real” moments. My thanks to Jeremy for sharing his “now it feels real” moment with us. If any other first-time authors would like to share their experiences, leave a comment. And if you’ve got a favourite vampire book you’d like to tell everyone about… yes, you guessed it… leave a comment! PS. Follow me on Twitter… or I’ll bite ya! I keep a list of blog topics in the back on my notebook, which I add to every time an appropriate idea crosses my mind. But not every thought that crosses my mind is worth a blog post in its own right, and so today I present… some random stuff. I like going to book launches. They are an important way of announcing a new release. They generate publicity, sell some copies and give people the chance to meet, talk to and get an autograph from the authors/illustrators. Sometimes there’s even free food/drink. Although The Glasshouse, by Paul Collins and Jo Thompson, was released last month, its official Victorian launch is yet to take place. So if you’d like to come along and join the festivities for this fab new picture book, you can. It will be held at 11.30am on Saturday 30 October at Prahran Market. More info about the launch is available from the Ford Street Publishing website. And you can read my thoughts about the book, here. I’ve known fantasy author Trudi Canavan for years. She’s a lovely person and a good friend. But, believe it or not, I’ve never read any of her books… until now, that is. I’m about three quarters of the way through The Magician’s Guild, the first book in her Black Magician trilogy, and I’m very happy to say that I’m loving it. I hang my head in shame for taking so long to get around to it. Given how much I am enjoying this book, I will, no doubt, blog about it more substantially in the near future. And I’ll definitely get around to the remainder of the books in the series with a little more speed. Another author that I have been meaning to read for ages but haven’t yet, is Lili Wilkinson. Her book, Scatterheart, is next on my list. Her mother, Carole Wilkinson, is one of my favourite authors and a long-time friend, so it seems logical that I should give Lili’s books a try. I’ve been following Lili on Twitter for some time, and her tweets are usually interesting, as is her blog. And this semester we have been teaching colleagues at the University of Melbourne in the third year subject “Encounters With Writing”. So it seems like a good time to finally get to one of her books! After having completed a number of school readers, I’m now finally working in earnest on my new novel. I’m six chapters in to what will undoubtedly be a barely readable first draft. My early drafts are always somewhat iffy… but that’s why re-writing is so important. It will be a number of drafts before I have something that’s okay to send to my publisher… and then, of course, there will be more re-writing. But that’s all part of the process, and I’m actually looking forward to each step. I’ll finish up with a couple of links. Firstly, an article by Paul Collins — “PODs, E-books, Nuts and Bolts”. It’s an interesting take on the whole electronic publishing trend and the difficulties faced by small press publishers wanting to branch out into the electronic world. Secondly, a blog post from Narrelle M Harris — “Lessons in language: Tactfully changing tack”. It’s a great little rant about the incorrect use of language. So if ‘changing tact’ bothers you, you’ll get a chuckle out of this post. Given that my post today has been about random things, I thought I’d finish up by asking if anyone out there has any random comments to make? Anything to do with books, writing or publishing? Your favourite colour? The airspeed velocity of an unladen swallow? And tune in next time as author Sean McMullen tells us a little about economic SF. PS. Follow me on Twitter… if you already follow me, how about following Lili Wilkinson or Narrelle M Harris? Q: What do novelists do in their spare time? A: They create iPhone applications, of course. Well, at least one Melbourne novelist has. Narrelle M Harris, author of the rather fab vampire novel, The Opposite of Life, recently launched Melbourne Literary, an app for the iPhone. This app can be used to discover literary locations, local authors and books set in Melbourne. Even I get a mention! Let me say here that I do not have an iPhone and I have no plans to get an iPhone in the near future. But if I did have an iPhone, this is exactly the sort of app that I’d get and use. So, I invited Narrelle to tell us how she went about putting together the information for this app. When you start a project, you never know what you’re going to learn in the research phase. I began the preliminary work on the Melbourne Literary iPhone application fairly confident that I knew a lot about Melbourne and its literary history. I ended up learning how much I didn’t know – but at least I filled in a few gaps. The app was inspired by Melbourne’s status as the second UNESCO City of Literature (Edinburgh was the first). It achieved the honour for very excellent reasons. This town has a history of being intimately involved in writing, publishing and bookselling from the very early days of the colony in the 1830s. Melbourne has incubated great writers, including one of the first women to write detective fiction, Mary Fortune (who predates both Fergus Hume and Arthur Conan Doyle). It has been birthplace to, or adopted home of, many acclaimed writers. It’s a place where people love to read – at home, on the tram, in little cafes and on the State Library lawn (weather permitting). I wanted to make the app as interesting and inclusive as possible. I wanted to surprise people with it – for them to discover things they hadn’t known about this town. I had my own little surprises along the way. Did you know that there is a memorial to Henry Lawson in Footscray Park, overlooking the Maribyrnong River? Raised in 1960 and maintained by the Henry Lawson Society, also based in Footscray? Have you been to The Drunken Poet, an Irish bar near the Victoria Markets? Instead of a mounted TV set, they have dozens of pictures of poets gazing down upon the merrymakers, with regular poetry nights! For years I’ve walked past a statue on a high column in Brunswick Street and wondered who that man was, with his hands spread so expansively as though in animated conversation with the universe. He proved to be Melbourne poet and raconteur, Adrian Rawlings, active in the poetry and jazz scene in the 60s and 70s. I discovered new writers and books too, not all of them Victorian. Anita Heiss is an Indigenous writer from Sydney, and her breezy, fun book set in Melbourne Avoiding Mr Right is the second of her “indigenous chicklit” books. I learned about Adrian Hyland’s crime novels, Carole Wilkinson’s dragon books and Gabrielle Williams’ Beatle Meets Destiny, which was marked as a ‘notable book’ in the CBC Book of the Year awards. Public art, cafes for book lovers, specialist publishers, architectural remnants of our literary past and Australia’s oldest Shakespeare Society (established in 1884) were all there, waiting for me to find them. Whatever else this project of mine may achieve, I hope that everyone who uses it discovers at least one new thing. As readers and writers, these discoveries give us a rich tapestry from which to construct and experience the written word. Those words are, after all, the stories we tell about ourselves to the world, and it’s a long and colourful epic filled with courage, failure, love, struggle and triumph. It’s good to know as many chapters of it as we can. Besides, it never hurts to discover a new café, or a new book to read while you’re there. To find out more about Narrelle, visit her website. To find out more about the Melbourne Literary app visit: www.iwriter.com.au/apps. Has anyone out there used the Melbourne Literary app? Does anyone know of any other literary apps? Leave a comment and share your experiences. PS. Follow me on Twitter… even though I’m not cool enough to own an iPhone! The 68th World Science Fiction Convention is over! Five days of panels, talks, signings, parties, awards and other related stuff, has ended. People from all over the world are making their way home… or perhaps sightseeing across Australia before departing our golden shores. I’m now sitting in front of my computer at home in Melbourne, still exhausted, trying to come to terms with the fact that it will probably be at least another 10 years before the Worldcon returns to our country. Since the convention finished, the blogosphere has been inundated with reports and reviews. Check out the report from Foz Meadows, author of Solace and Grief, for ABC Radio National’s The Book Show Blog. Also, check out the blog from Narrelle M Harris, author of The Opposite of Life. If you’re on Twitter, you can see posts about Aussiecon 4 at #Aussiecon4 and #Aus4. Reading the various reports, it is evident that different people had very different experiences. Some people partied; some people networked; some people collected autographs and listened to their favourite authors; some people promoted; some people shopped in the dealers’ room; and some people sat around chatting and drinking way too much coffee. I tried very hard to do a bit of everything! 🙂 And now it’s time for me to add my view of Aussiecon 4 to the ever-expanding blogosphere. The Ticonderoga Publications table in the Dealers’ Room. The writer Guest of Honour was Kim Stanley Robinson, author of numerous science fiction novels, including Galileo’s Dream and the Mars trilogy (Red Mars, Green Mars, and Blue Mars). I’ve never read any of his novels, as my taste in science fiction tends to lean towards lighter, adventure-based story-telling, rather than hard science. Despite this, I made the effort to attend his Guest of Honour speech… which was thoughtful, humorous and very entertaining. What I enjoyed most about it, was the insight into his non-writing life; and how he felt that one of the greatest things given to him by his writing career was the opportunity to work from home and watch his kids grow up. As a writer who is also a stay-at-home-Dad, this really struck a chord with me. I’m even tempted to go off and read one of his books. Kim Stanley Robinson giving his Guest of Honour speech. The artist Guest of Honour was Australian illustrator and author, Shaun Tan, creator of many wonderful books, including The Lost Thing, Tales From Outer Suburbia and The Arrival. I’ve heard Shaun speak numerous times over the years, but I never tire of listening to him. Given that my artistic abilities do not extend beyond stick-figures, I am in awe of anyone who can draw… and can this guy draw, or what? And he makes it look so easy. And he comes across as such a nice guy. Shaun Tan (right) on a panel about art with D.M. Cornish (centre) and Richard Harland (left). Now, let’s move on to Doctor Who, because as any regular Literary Clutter reader will know, I am a Doctor Who fanboy. Two writers who worked on the revived Doctor Who series were in attendance at the convention — Paul Cornell (who I’ve previously interviewed on Literary Clutter) and Robert Shearman (who wrote first season’s “Dalek”, the last truly awesome episode to feature this race of pepper-pot encased aliens). I got the chance to meet both of them, and even spoke on a panel with Mr Cornell — “Playing in someone else’s sandpit: franchise writing”. There were a number of interesting Who related panels, including the one I was on, “We are all fairy tales: Doctor Who’s fifth season”, which was a discussion of how the series had changed with its new production team. It was during this panel that I referred to head writers Russell T Davies and Stephen Moffat as “Rusty and the SMoff” and made the grand statement: “I’d have the River over the Pond, any day!” — although I guess you’d need to be a fan to find any humour in this. Thankfully, neither Paul nor Robert were there for that one! Of course, there was much discussion of both film and television during the course of the convention. One session I found particularly interesting was George RR Martin’s on-stage interview with Melinda M Snodgrass. 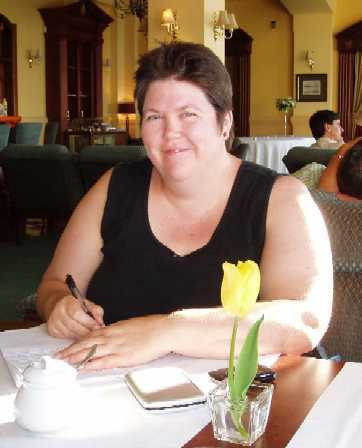 Melinda is author of numerous novels (including the Circuit trilogy) as well as being a scriptwriter who has written for, amongst other shows, Star Trek: The Next Generation, SeaQuest DSV, The Outer Limits and Sliders. George is author of countless novels (including the Song of Fire and Ice series) as well as being scriptwriter of 14 episodes of the 1980s television series Beauty and the Beast. The interview worked extremely well due to the obvious rapport they have from being long-time friends and colleagues, and was a wonderful insight into the world of television writing. And then, of course, there were books… many, many books! And much discussion of those books. Some of the panels I attended included “YA speculative fiction: industry overview and insights”, “Getting published in YA spec fic”, “Nuts and bolts: editing YA spec fic, an insider’s view” and “What’s hot and what’s not: trends in YA spec fic” — do you see a pattern forming here? There were also lots of great readings, by authors local and imported. The highlight for me was the tag-team reading session by Richard Harland and Jack Dann, each providing character voices for the other’s reading. I’ve barely scratched the surface and I’m out of blog space. Tune in next time as I continue to ramble on about the awesomeness that was AUSSIECON 4! Vampires! Post number two in a series of three about the pointy-toothed blood-suckers we all love to read about. This time around I have enlisted the help of two authors who have written vamp fic. I’ve asked each of them to share with us their favourite vampire book. First cab off the rank is Narrelle M Harris, author of The Opposite of Life. John Lindqvist’s Let the Right One In is a superb vampire novel. It’s Swedish, but the English translation captures its setting of a bleak suburb in 1980s Stockholm perfectly. Oskar, who is viciously bullied at school, befriends strange newcomer, Eli. The fact that Eli is a vampire and a killer is contrasted with the idea that Eli is also an abused child. The line between victim and monster is blurred, here and elsewhere in the story. 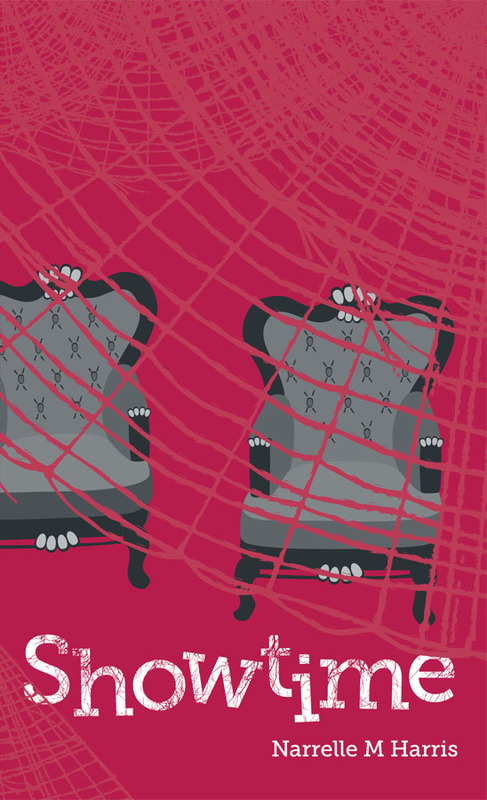 It’s a disturbing horror story, but also ultimately a gentle love story. It’s elegant, atmospheric and unlike any other vampire story I’ve ever read. You can find out more about Narrelle and her writing on her website. You can also follow her on Twitter. And for those of you who’ve read The Opposite of Life, you can also follow her two lead characters, Gary (the vampire) and Lissa (the librarian), on Twitter. Next up we have Foz Meadows, author of Solace and Grief. I love the Evernight series by Claudia Gray. On starting the first book, I was aggressively sceptical, but once I reached the halfway point, I couldn’t put it down, while the sequel volumes, Stargazer and Hourglass, were mesmerising. Gray’s characters are vividly realistic; her plotlines pull no punches. The more the series develops, the more it becomes apparent that a skilful long game is in effect: the mythology is built with care, and there are no loose threads – only questions that haven’t been answered yet. The writing is sleek, the pace swift, and the tension perfectly orchestrated. Definitely worth reading! You can find out more about Foz and her writing by checking out her blog. My thanks to Narrelle and Foz for stopping by. Interview With The Vampire by Anne Rice. This is a book that lots of people have raved about. My first encounter with it was the film version. I really liked the film and so I thought to myself… most film adaptations are not as good as the original books, so I must go and read Interview With The Vampire. Which I did… Unfortunately. I found the characters annoying, the style dry and the whole thing long-winded and boring. After spouting my disappointment at anyone who would listen, an avid Anne Rice fan insisted that the second book in the series was much better and that I should give it a go. I didn’t. In fact, I’ve never read another Anne Rice book. Life is too short and there are way too many other books that I really want to read. Which now brings me to the Twilight books. Tune in next time as I tell you why I haven’t read Twilight. Vampires seem to be the in thing at the moment. Almost everyone is going ga-ga over the Twilight books and there is now a glut of teen vamp fic. Hollywood is, of course, cashing in on this, with numerous pointy teeth films and tv shows gracing our screens. For a bit of a laugh, check out the trailer for I Kissed a Vampire, a musical web series. Vampire fiction has been around for a long time. The first vampire book I ever read was Stephen King’s Salom’s Lot. It remains one of my favourites. Since then, I’ve read the occasional bit of vamp fic, including the granddaddy of them all, Dracula (which is well worth a read, even if you’re not into vampires). The one that really sticks in my mind, even though I read is about 13 years ago, is Poppy Z Brite’s Lost Souls. She has an interesting take on the vampire mythology. Her vamps are a separate species and breeding with humans results in each successive generation being less vampiric. The oldest vampire in the book can eat or drink nothing but blood, has pointy teeth and can be harmed by sunlight. The youngest is a bit of a goth — sunlight won’t hurt him but prefers to go out at night; his teeth aren’t pointy and although he doesn’t need to drink blood to live, he does come to develop a taste for it. There’s a lot more to it, but I’m working from memory here. I’ve always thought that what this world really needed was some good vampire books set in Australia, preferable Melbourne (my home city). A number of years ago I read Vampire Cities by d’ettut (yes, d’ettut is the name of the author… pseudonym perhaps? ), which was partly set in Australia. I remember thinking it was a weird, arty sort of book and that vampires weren’t actually the focus. It mustn’t have made much of an impression on me as I can remember nothing of the story. More recently, I read Narrelle M Harris’s The Opposite of Life, which is set in Melbourne. I LOVED this book. It’s got lots of blood, dead bodies and pointy teeth and yet it’s a very atypical vampire story. The heroes are a geeky librarian and a slightly podgy, daggy vampire who wears loud Hawaiian shirts. The book makes marvellous use of its Melbourne locale and is worth a read for that alone. Harris is writing a sequel… I can’t wait. Check out my review of The Opposite of Life. I also recently read Solace & Grief by Foz Meadows. The author calls the book an “urban fantasy” rather than a vampire novel. The main character is a vamp, as is the main villain, but there are other supernatural characters as well. It’s a young adult novel set in Sydney (not as good as Melbourne, but hey, at least it’s in Australia) and it’s got quite a different feel to it from any other vampire book I’ve read. It’s been getting some great reviews and with good reason – it’s a really good read. It is the first book of a trilogy called The Rare. Book 2 is currently in the works… definitely one to look out for. 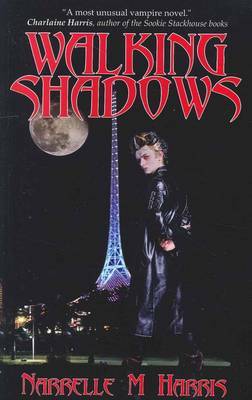 There are probably other Australian vampire books out there. To be perfectly honest, I’ve never made a point of searching them out. The ones I’ve read were those that I happened across. So if anyone out there has any recommendations, I’m all ears… um… err… teeth? Tune in next time for another vampire post, this time with the assistance of authors Foz Meadows and Narrelle M Harris.